Posted on March 29, 2019 at 10:35 am. Artists Maria Rodriguez, Bizar Gomez and Anke Gladnick have finished painting a new mural on the exterior wall of Open Signal: Portland Community Media Center on NE Martin Luther King, Jr. Boulevard at Graham Street in Portland. “Let’s talk” is the fifth temporary mural created in the last two years as part of the Fresh Paint program, a partnership between Open Signal and the Regional Arts & Culture Council (RACC). The mural will remain on display through September 30, 2019. 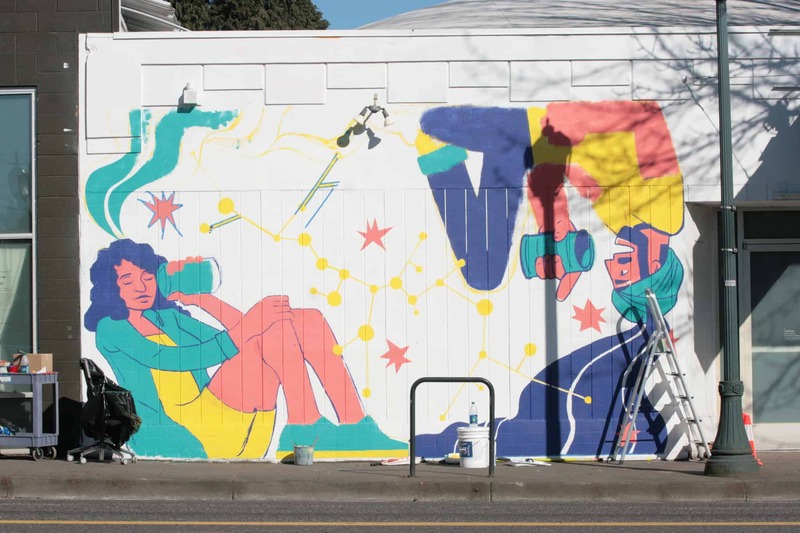 Two additional murals will be painted through Fresh Paint by artists Munta Mpwo and Limei Lai in October 2019 and April 2020. Raised in the desert of Phoenix, AZ and now living among the trees in Portland, OR. Bizar Gomez is an illustrator and painter who is doing all he can to continue existing. Working primarily in Gouache, Graphite, Ink and digital media, his work involves mixing urban world iconography, dreamlike surrealism, stylized figures,and social consciousness to create interesting visuals and narratives. Maria Rodriguez is a Mexican-American artist living in Portland, OR getting her BFA in illustration at the Pacific Northwest College of Art. Through shape and color she often explores themes of identity, culture, and nostalgia while also creating work that is playful and light hearted.